It seems like we just started, but the Legislative Session is moving along very quickly, with deadlines already approaching. There is a reason for that, of course. While the United States Congress meets year-round, we only meet for 90 days or so, which means we have to move quickly to accomplish the business of the people. This week, work continued in committees. Bills are beginning to make their way to the floor, where the Majority Leader can then bring them “above the line” for consideration. The deadline for most bills to be passed out of their originating committee is February 28 th . We will then be on a brief break and then return to consider bills passed in the Senate. Thank you to those of you who replied to my first newsletter. I appreciate your feedback. The first week was filled with the ceremonial trappings of the inauguration and the beginning of Session. This week was shorter, due to Rev. Dr. Martin Luther King Jr. Day and the weather, but we adopted rules and began the important work in committees, where the bulk of our legislative time is spent. If I were to label the early part of the Session, I would call it the “listening and learning” stage. Through the various presentations and testimony, legislators must do exactly that. In fact, I approach my job as a legislator in a manner similar to the way I do as an attorney – learn the facts, listen to all sides and particularly my constituents, and then work towards a resolution that is consistent with those facts and in accordance with our principles. The 2019 Legislative Session began Monday January 14th with the Inauguration of our 48th Governor and the swearing in of other state-wide officials and the House and Senate. As I drove to the Capitol that Monday morning, I thought about the remarkable journey that led me to the honor of serving as our State Representative for District 28. I am both humbled and honored that Republican Primary voters nominated me to be their candidate for State Representative in District 28. Turnout was higher than usual this year, with around 3700 people casting a ballot in our Republican Primary. As we enter the closing hours of this campaign, I want to thank all of my supporters for their generosity in both time and treasure during the summer. From volunteering by driving or walking for me door-to-door, taking a yard sign, contributing to my campaign, to endorsing me publicly, I will forever be grateful. One example is the mailer we recently sent below, where a large number of my supporters agreed to include their name as an endorser of my campaign. Please remember to make a difference and vote! You can vote today, tomorrow, or at your polling place on Tuesday, August 7th! 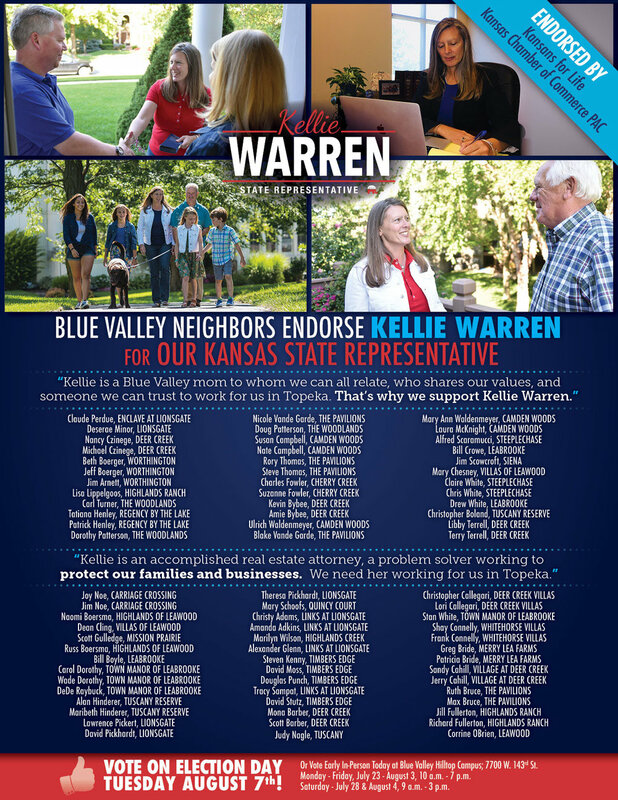 Topeka, Kan. (July 2, 2018) – The Kansas Chamber PAC has endorsed Kellie Warren in her bid for the Kansas House of Representatives in District 28. 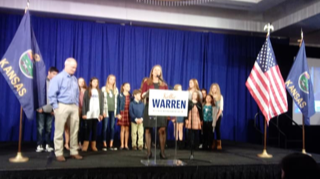 Kellie Warren, a lifelong Republican, is an attorney and a mom who is very active in the Blue Valley Schools, where her four kids attend. A trusted problem solver, Kellie is committed to depoliticizing our schools and working with other legislators to find lasting solutions to the challenges facing our state. One solution is ensuring Kansas remain pro-business. "I am grateful for the endorsement from the Kansas Chamber PAC. As a supporter of free-market principles, I understand that in order for our economy to grow, we must have policies in place that allow our businesses to flourish," said Warren. The uncompromising mission of the Chamber PAC is to support those who stand for free market principles, pro-growth tax policies and limited government. The legislators and candidates who have received Chamber PAC support share this mission. Campaign Update: Join Us This Summer! As the weather heats up, so does the campaign! You may have seen my white mini-van going through your neighborhood - and if you haven't yet, you will soon!